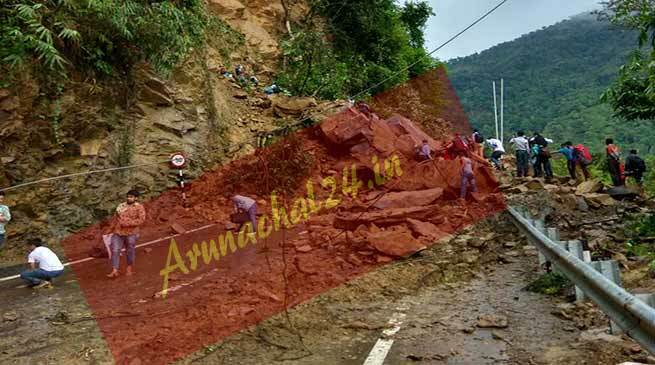 A massive landslide that occurred last night at Sonapur on Shillong-Silchar National Highway 44, that connects the Assam capital with Silchar via Jowai in Meghalaya, has brought traffic to a grinding halt, leaving hundreds of vehicles stranded on both sides. The landslide that brought in massive mound of mud and boulders triggered by incessant rainfall over the past couple of days, blocking the vital NH, with passengers of several vehicles having a providential escape from the jaws of death. There were no reports of any casualty. Several bulldozers have been pressed into service to clear the debris on NH 44, which is not only the link between the two States, but also vital llfeline for Tripura, Mizoram and Barak Valley of southern Assam. Heavy rainfall accompanied by thunderstorms continued to lash large swathes of the Northeast, including Assam.